I don't often purchase powder blushes, as I feel that the finish they leave is drying, aging, and unflattering for anyone past their twenties. I generally stay with creamy formulas and stains. There are exceptions--I love the powder blushes by Estee Lauder, Lancome, Tarte, and some other companies--but in general they don't appear as a sheer bloom of color and are often cakey as well, leaving a ...read morerepugnant look of demarcation where the blush ends and your own skin begins. I did pass the Milani products in the drugstore, and the array of their baked powder blushes looked so heavenly, so very tantalizing on the gleaming shelves that I bought two immediately--"Rose D'Oro" and "Dolce Pink." "Rose D'Oro" is what the name suggests--a gold-infused deep salmon. 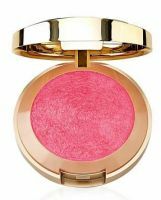 There is shimmer, to be sure, but not so much that this blush can't be worn during the daylight hours. It is best to keep the included brush handy for touch-ups and use your own tools when applying at home. There is more pigment than you would except for a blush that sells for under $8.00--and it rivals even the priciest brand when it is on your skin! The rose gives me a warm flush, with not even the tiniest hint of an arid, stale look. You can amplify it for a more glamorous night time look, as coverage is buildable. And then there is "Dolce Pink." Indeed it is a sweet pink--it is a particularly beautiful, delicate rose. I was especially smitten by this color. It leaves a subtle radiance in any light, even harsh, unforgiving daylight, and remains ultra-flattering. Why spend a small fortune when there are products like this available? Excuse me, as I'm on my way out of the house to pick up a few more . . . I finally found these at Walgreens. I wanted to try them based on all the positive reviews. I ended up getting four of them. The packaging is pretty sturdy. I threw out the brush it came with, but I always do that. The product itself is really nice, it looks much more glittery in the pan than on skin. It is shimmery on, but definately not over the top at all. Of the colors I got this is my least f...read moreavorite, because it pulls really warm on me, it looks more pink in the pan. Great product overall, will buy more of these. When I first saw reviews on these online, I was immediately intrigued: not only are they shaped very similarly to my much beloved collection of MAC Mineralized Skinfinish blushes, but they are so much more affordable at $7.99 a piece! Everywhere I read reviews on these blushes, they are always saying something along the line “You need this!” or “Dupe for MAC MSFs”. I love this blush so much–the lightest sweep of your brush will pick up enough product to apply on your cheeks. One thing that definitely stood out was the plastic packaging. I’m not a fan, and I think the gold/yellow packaging looks so tacky! It’s not as sturdy as I hoped, and I really hated how it looks, and would never consider purchasing it if it wasn’t for the quality. All of the colors are packed with glitter, so this might not be a favourite for some. My favourite of the bunch have got to be Corallina and Rose D’Oro. They are the most gorgeous coral shade, with shimmery gold veins across. It’s not only pretty to look at, but looks amazing on my skin! It’s quite powdery, so it’s best not to sweep it back and forth, but rather pat the blush several times lightly. I added a swatch for MAC's Margin and Milani's Rose D'Oro they are almost exactly the same, I'd say they are almost interchangeable as far as color goes, if anything under direct light margin is a bit rosier, and rose d'oro a bit more peachy, on my skin tone at least, NC 25. Also, the Milani blush is much more pigmented, I had to swatch margin way more times to get it to show up. This is a really beautiful blush, like many others have said it's a rose color with goldish veining. On my skin it looks rather peachy/bronze looking, kind of reminiscent of MAC's Margin. The gold shimmer is not too much but really makes my face have a glow to it especially now in the winter. I bought this, corallina and red vino at the same time, I ended up giving way more love to corallina, until I left it in another makeup bag and used this instead. Its really pigmented and you can layer it, I find that I dont use a bronzer when I wear this, whereas I need one with corallina and red vino, this is a bronzy blush, at least on my skin tone. What i love about these baked blushes is the fact that they dont look powdery on the skin, as a retin-a user I really appreciate the pigmentation and the fact that they formulation doesnt cling to my flakies. I love the colors/bronzers and blush milani is coming out with. Great product.